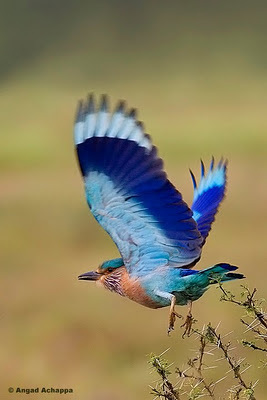 While quite a common and colorful bird, not many people know that the Indian Roller is also the State Bird of Karnataka. It was formerly called Blue Jay. They are usually seen perched on trees and electric wires along roads and also in open grasslands. It is a 26-27cm stocky bird. They mainly feed on insects such as beetles, grasshoppers and crickets. The Indian Roller is easily distinguished from the migratory European Roller, the former has a brown breast while the latter has a blue breast. Great picture Angad, wonderful colours. Great picture of a beautiful bird. Wow. That is an amazing pop of blue under their wings. Definitely more dazzling than the jays in the states. Well captured flight.As for the feet;amazing. What a lovely bird with a stunningly beautiful blue color. Wow, Fantastic picture! Good work! We have seen different roller in Southafrica, they are really beautiful birds! Really beautiful bird. It;s like a little explosion of blue.